Bikes have passed beyond being simply mechanical objects used for travel to become symbols of unity. They exist in our lives as companions, entering our lexicon and folklore through transit, speed and mobile revelry. Rollin’ Contact draws from the terminology of physics to describe the point of contact between a wheel and its surface. 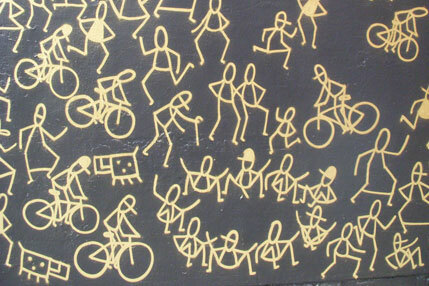 Expanded broadly, it represents the themes of connection and commonality between people and bikes. Between bikes and art. Between art and people. The exhibition will feature drawings, prints, silkscreens, photographic images, design, video, paintings, sculptures, craft and textiles that expand on the theme. A component of the show comprises works by artists who form a part of the Inter-Location Project, (ILP). ILP is an independent organisation formed to build a DIY arts bridge between the two cities of Jogjakarta, Indonesia and Melbourne, Australia. ILP aims to express and maintain varied forms of artistic and cultural dialogue, creative commonalities and friendship between these two bicycle-loving cities. Akẻan, Anton Subiyanto, Bayu Widodo, Betty Musgrove, Bhavani Stoddart, Claudie Frock, Colin Moore, Dan Bell, Dan Goronszy, El Kampretto, Georg, Jarrad Kennedy, Jarrod Mortimer, Joshua Weeks, Kasia Lynch, Lauz, Lindsay Cox, Love Hate Love, Micheal P Fikaris, Oscar Vincente Slorach-Thorn, Pandarosa Design, Snotrag, Steve Boyd, Stewart Cole, Tom Civil and Upper Left Arm.